There are many conflicting accounts regarding the true characters and personalities of King Henry VIII and his second wife Anne Boleyn. Those who are pro-Boleyn depict Henry as a cruel, vicious husband and Anne as an innocent pawn in the political games of her ambitious family, persecuted by the Catholic faction intent on returning England to the ‘true faith’, and brutally murdered by Henry. A different picture is painted by those who were anti-Boleyn and portray a poor cuckolded man, bewitched by a sorceress using black magic to steal him from his loving wife, and who was guilty of adultery. The Henry and Anne of 1536 are contrasting characters to those from 1526 when Henry realised his love for Anne. For the duration of their short marriage Anne was never fully accepted by the English and they frequently had to reaffirm their love for one another. These circumstances would put any couple under considerable pressure. When Anne arrived at Court in early 1522, Henry had been married to his brother’s widow, Katherine of Aragon, for 13 years. The marriage appears to have been happy and it seems that they were, initially, genuinely in love. Though Katherine had been pregnant many times, only one child survived past babyhood – a girl. Henry was desperate for a male heir to continue the Tudor line and sometime prior to Anne’s arrival, he realised that he would not have any sons by Katherine. When Henry had ascended the throne at the age of eighteen, he was a handsome prince, well-educated and a talented sportsman. A charismatic, confident man and well respected globally. Age and illness, however, was to turn this around in the years to come. Anne had been sent to Europe at around the age of twelve where she received a good education, taught how to behave in a royal court, and other accomplishments which would prove invaluable when trying to secure a good marriage. When she arrived at the English Court, she was skilled on the lute and virginals, could sing and dance and was an expert needlewoman. When she made her debut in 1522, her entrance caught the attention of everybody at Court and though she didn’t conform to the traditional conventions of beauty with her dark eyes and hair and sallow skin, her quick wit and intelligence marked her out from the others. She dressed in the latest French fashions and conducted herself with an air of confidence. Indeed, it was only a matter of time before Henry became captivated by her. He had previously taken her elder sister, Mary Boleyn, as his mistress and initially intended on elevating Anne to this esteemed position. However, she would not succumb as easily as her sister. Although she enjoyed flirting with him, the prospect of becoming a discarded mistress like Mary didn’t appeal to her or fit in with her pious nature and so when he made his proposal, she refused him. Far from dampen his ardour, it enflamed his passions and he began an almost obsessive pursual of her. His love for Katherine decreased dramatically and he spent even more time with Anne upon whom he lavished gifts and wrote beautiful love letters. Anne could not have helped being touched by his declarations and would have felt uplifted to read his words and flattered that someone felt so strongly for her. At first, Anne was unwilling to go to the lengths Henry desired and even distanced herself from him by returning home to Hever Castle in Kent. Rather that put Henry off, he became infatuated. When he wrote to her he waited eagerly for a reply, reading her every word when she did and becoming frustrated when she didn’t. In one letter he offered to make her his sole mistress to the exclusion of all others but she refused and told him she would accept marriage or nothing. Henry immediately made enquiries into obtaining a divorce from Katherine, not wanting anything or anybody to stand in the way between him and the woman he truly loved. Henry was now beginning to show the ruthless streak which would become more prominent as the years of his reign progressed. He wanted Anne and he was determined to have her. His treatment of Katherine was heartless when she refused to submit to his request of a divorce and confess the invalidity of their marriage. His long time best friend, Cardinal Wolsey, also experienced the King’s displeasure when he failed to gain an acceptable conclusion to the divorce. Henry could hardly bear to spend any time away from Anne and she soon returned to Court where the rumours started of ‘the King’s Great Matter’. Both Henry and Anne believed they would be married within a matter of months, never once imagining it would actually be years. Yet during this time their love and commitment for each other never wavered. Anne began to take on a more prominent role at Court and was given her own lodgings near to the King. In preparation for their eventual marriage Henry elevated his beloved to the peerage on 1st September 1532 by creating her Marchioness of Pembroke and a couple of months later she accompanied him as consort on an official visit to France. Finally, after several years of waiting for a favourable decision from the Pope, Henry decided to take matters into his own hands and he made the dramatic step of breaking with Rome and began the English reformation which would ultimately lead to the country becoming a protestant nation. Anne and Henry were overjoyed when they eventually married in January 1533. Anne became pregnant almost immediately and both fervently hoped it would be a boy. Henry organised an extravagant coronation to make her his queen in place of Katherine and as a public display of his love. When Anne arrived at the Tower after her procession through London, they approached each other smiling and he held his wife in his arms and kissed her. Henry not only loved and adored Anne, but he was proud of her and desperately wanted his subjects to recognise her as his true, lawful wife and became increasingly upset when many refused to do so. The first sign of any change was later in 1533 when Anne found out that Henry was having an affair with one of her ladies. She reacted with rage and jealousy which must have come as a shock to the King as he had been used to Katherine ignoring his indiscretions. This shock soon dissipated and he told her to do as her betters had done before her. After seven years Henry finally had the object of his desires but the thrill of the chase was gone. This can only have worried Anne as she had enjoyed being his unofficial chief advisor for so long and she could sense her hold slipping. As her position was already precarious, with many subjects refusing to accept her as queen or Henry’s legal wife, this could only have filled her with fear. The affair soon cooled and after the ‘disappointment’ of Elizabeth’s birth, they focussed their attention on trying for another child. Over the next couple of years, Henry remained loyal to Anne in the respect that he did everything in his power to have her universally recognised as his wife and queen. He devised Acts of Parliament making it an offence for anyone to question the validity of his marriage and, in lieu of any sons he and Anne may have in the future, made Elizabeth his heir. During this time, it is known that Henry’s eye was still wont to wander and he had more affairs. Though they almost certainly still loved one another, their relationship began to cool and they became increasingly despondent when Anne suffered a succession of miscarriages and stillbirths. They were united in a sense of relief in January 1536 when news reached them of the death of Katherine of Aragon. Finally, Anne had no rival to her position and Henry could no longer be persuaded to take Katherine back. All Anne had to do now was provide Henry with the son and heir he desired. Later that month, ironically on the same day as Katherine’s funeral, Anne miscarried her child – a boy – which would have secured her position as queen and a place in Henry’s life. A heated exchange occurred between them both during which Henry stated that it was obvious God would give him no sons by her. Anne knew that she was in a vulnerable position and with her enemies closing in, she had to fight, literally, for her life. 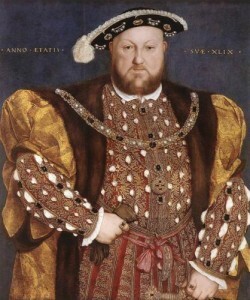 Henry was getting older and his desperation for an heir became all-consuming so he began to muse on taking another wife. One of Anne’s maids, Jane Seymour, caught his eye and Henry noticed she came, not only from an extremely fertile family, but one with a high ratio of sons. Within weeks, Jane began to replace Anne in Henry’s affections. By April 1536, Henry was still supporting Anne’s position, but the love they once had for each other had become stale. The once carefree and captivating Anne Boleyn, “The Most Happy”, had become pale, lost weight and was jealous, irritable and temperamental. The pressure to keep Henry happy and produce a son was taking a toll on her. Henry also changed from the jovial, charismatic king of his early reign into an aggressive, cruel and paranoid old man. Anne’s enemies were turning against her and fed Henry with stories of affairs with several of their courtiers including her own brother, George. It was Henry’s mistrust of people and his desire to beget sons on a new wife which led him to believe these allegations and at the beginning of May, he gave his consent for her to be imprisoned in the Tower. Anne was oblivious to the reason behind her arrest and she was unable to contact Henry to ask why he had done this to her causing her mind to work overtime trying to make some sense of the situation. Less than three years before, they had been deliriously happy and she had arrived at the Tower to be crowned Queen. Now she was a prisoner and Henry could no longer bear the sight of her. Indeed, as soon as the news of Anne’s death reached him he immediately went to Jane Seymour and within twenty four hours of his widower-hood, they were formally betrothed. It was as though Anne had simply never existed. It is almost incomprehensible to understand how a man can be so full of love and longing for a woman and then within a decade, hate her so much he commands her murder. Anne’s change of character can be appreciated and sympathised with given all she had to endure from the moment she married Henry. She was the Queen and had to behave in a certain manner and most importantly, provide a son and heir to succeed Henry. The stress of these demands coupled with the fact that she was an unpopular consort and seen by the majority as a supplanter to Henry’s first wife took their toll on her health and her appearance. Henry’s extra-marital affairs only served to remind Anne of the insecurity of her position and her failure to deliver what he so desperately wanted. It is to Anne’s credit after enduring all of this, sitting through a trial where the guilty verdict had been decided in advance, and being condemned to death, she walked out of the Tower on the morning of 19 May 1536 and “died boldly”, delivering her final speech with a “smiling countenance” before kneeling down and taking her leave of this world.